(Nanowerk Spotlight) Nanotechnology will play an important role in future space missions. Nanosensors, dramatically improved high-performance materials, or highly efficient propulsion systems are but a few examples (read more: "Nanotechnology in Space"). One particularly important issue is the protection of satellites from electrostatic discharge (ESD). In space, the external insulating surfaces accumulate electrostatic charge as a result of exposure to space plasma, including high flux of charged particles especially at geosynchronous earth orbit (GEO). If that charge accumulation suddenly discharges it may damage the electronics of the spacecraft. The space industry therefore has a strong requirement to develop a flexible ESD protection layer for the exterior cover of satellites. A study conducted by nanotechnology researchers at Tel Aviv University together with scientists from the the space environment department at Soreq NRC, explores carbon nanotube-polyimide (CNT-PI) composite materials as a flexible alternative for the currently used indium tin oxide (ITO) coating, which is brittle and suffers from severe degradation of the electrical conductance due to fracture of the coating upon bending. "We developed electrically conducting and flexible CNT-PI films specifically for space applications using polymer solution infiltration into CVD-grown entangled CNT sheets with cup-stacked nanostructure," Yael Hanein, a professor at Tel Aviv University and Director of the university's Center for Nanoscience and Nanotechnology, tells Nanowerk. "This fabrication process prevents CNT agglomeration and degradation of the CNT properties that are common in dispersion-based processes. 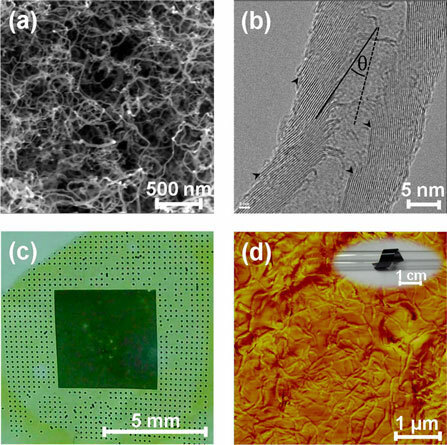 The team has published its findings in the November 3, 2014 online edition of ACS Applied Materials & Interfaces ("Reinforced Carbon Nanotubes as Electrically Conducting and Flexible Films for Space Applications"). "We specifically explored the electrical conducting mechanism of CNT-PI composites, given that we sought a simple method to control CNT distribution within a polymer matrix, while protecting the CNT properties," says Nurit Atar, a PhD candidate and first author of the paper. "We found that the conductivity of the CNT sheet was preserved in spite of the insulative PI infiltration. This implies that the electrical current was enabled through the original entangled CNT network that was not interrupted by the insulative PI. This proves that the polymer solution did not penetrate into the interface at the CNT junctions and so the original continuum of ohmic contacts between adjacent CNTs was preserved." CNT-PI composites were produced before by dispersion of CNT powder in polymer matrices. Since CNTs are insoluble and tend to agglomerate as bundles, sonication and functionalization are commonly used to improve homogeneity. These incorporation techniques often result in severe degradation of the original CNT properties (e.g., electrical, thermal, and mechanical characteristics). The preparation method used by the Israeli team is based on PI infiltration into CVD-grown CNT sheets, enabling preservation of the original CNT sheet conductivity with no degradation related to the insulating PI matrix. Hence, higher electrical conductivity can be easily reached, e.g., by controlling the CNT growth process (CVD) to form denser CNT sheets with higher conductivities. "Another advantage of the technique presented in our recent paper is the compatibility with patterning of CNT along the composites, which is not facilitated by the dispersion technique," Atar points out. As electrically conducting films, the CNT-PI composites can prevent electrostatic charge accumulation on the exterior of satellites. Particularly, the researchers found that their CNT-PI films are durable in space environment hazards such as high vacuum, thermal cycling, and ionizing radiation. The team's current work focuses on improving the stability of the CNT-PI film to atomic oxygen, which is dominant at low earth orbit space environment. The challenge is to introduce inorganic nanoparticles into the polymer matrix to create a self-passivation layer when exposed to atomic oxygen.